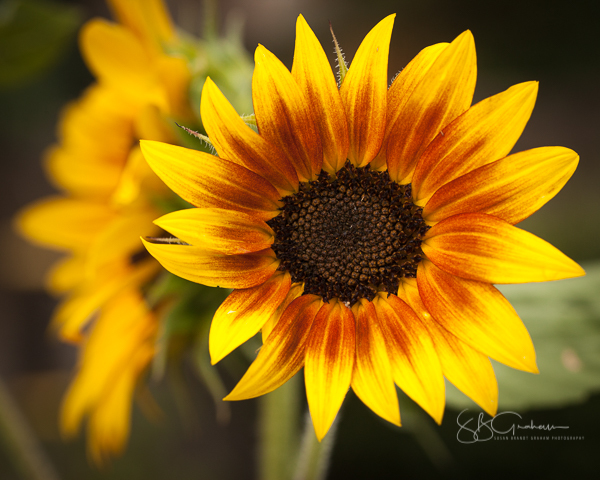 Sunflowers – a friend says they have PMA (Positive Mental Attitude). It is hard not to smile around sunflowers. That may be especially true with a gorgeous New Mexico sky as a background. Enjoy. Multiple bees are very busy on these! This stalk is very tall, and I cannot see what the face of this sunflower looks like. It certainly looks interesting from the base, looking up. I am anxious for the buds to open so I can see what this particular flower really looks like. Albuquerque August: the smell of roasting chiles, frequent afternoon monsoon showers and occasionally heavy rains, the last days of the rufous hummingbirds, and a view toward the State Fair, Balloon Fiesta, and arrival of the sandhill cranes and other migratory birds. 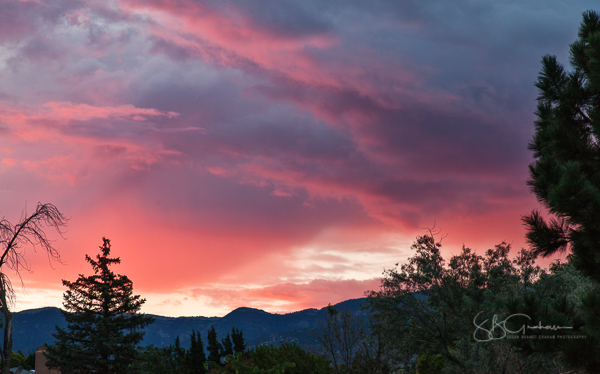 August suggests the coming of fall in New Mexico, one of the truly magical seasons here. But, August has magic of its own! A typically beautiful sunrise one August morning, calm and colorful. The afternoon brought a 1.5 inch rain to my house, very welcome and needed moisture! However, the flash flooding that followed resulted in one known death yesterday. Stay away from arroyos, and don’t drive through running water on a roadway! August Sunrise. Late Afternoon Brought a Monsoon Rain! 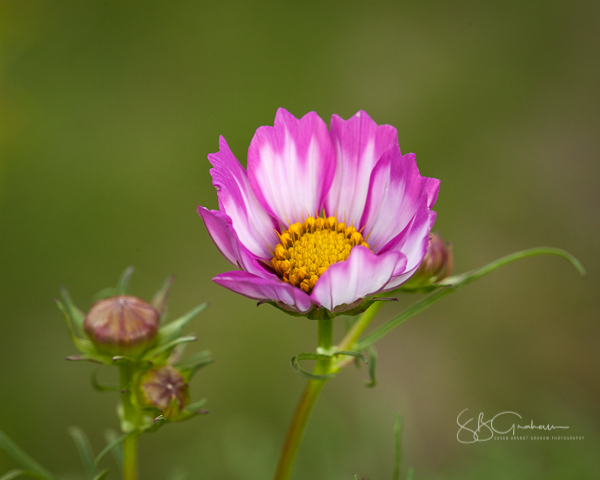 I planted cosmos somewhat late this year, and they are beginning to bloom. They are a lot of fun to photograph. The goldfinches will soon be playing in them, eating seeds. The black-chinned hummingbirds, who stay later than the rufous, will enjoy the nectar of these flowers until they head south. 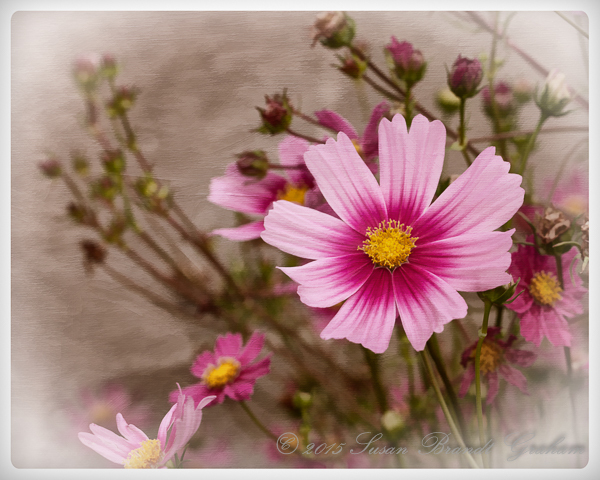 I just enjoy photographing cosmos. 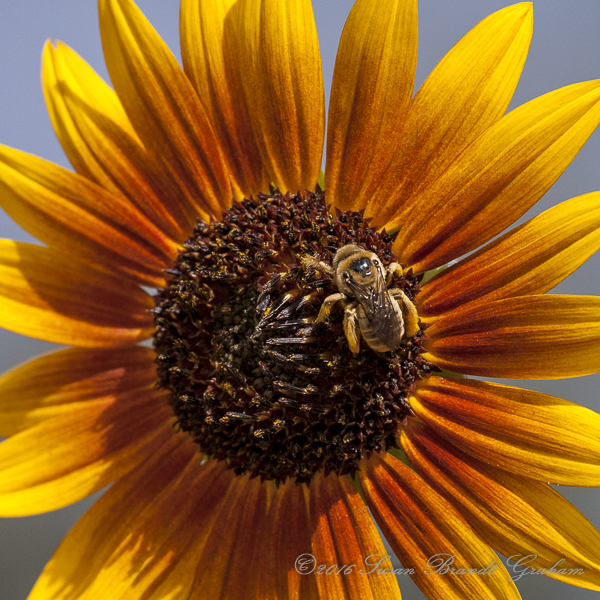 The sunflowers are in full bloom, and attracting many very busy bees. These bees are laden with pollen! 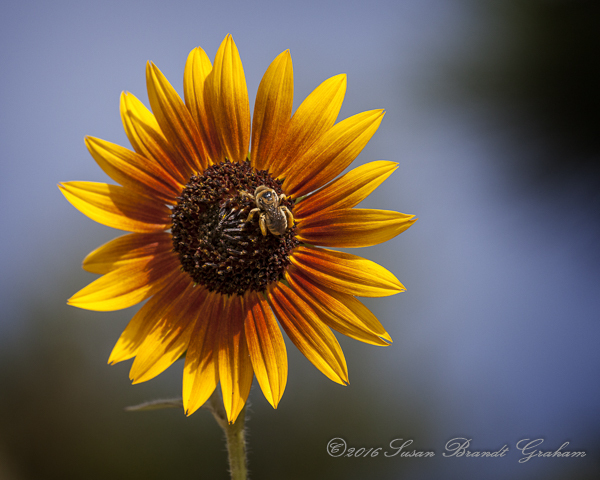 Albuquerque August: Bright Sunflower and Busy Bees! The Price Garden is always fun to revisit, even if only in the form of images. Today was the hottest day of 2017 to date in Albuquerque. 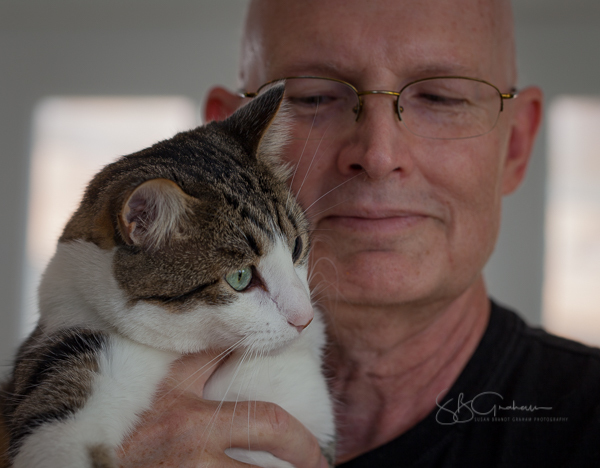 It was nice to be in and working on photographs. These images were taken in May of this year. Thank you, Tim and Laurie! A gardening challenge in the way of a very late and possibly hard freeze this weekend is headed to the Albuquerque area. The “average frost free date” for much of the time I have been here has hovered around April 15. Late freezes are not entirely unknown, however. We had a hard freeze in May of 2005. An Arrangement School was held at the same time as the Albuquerque Rose Show at the end of May. I still smile at the number of “Betty Boop” roses featured in rose arrangements that year, as well as in the show itself. That happened before we had rose photography in our rose shows. 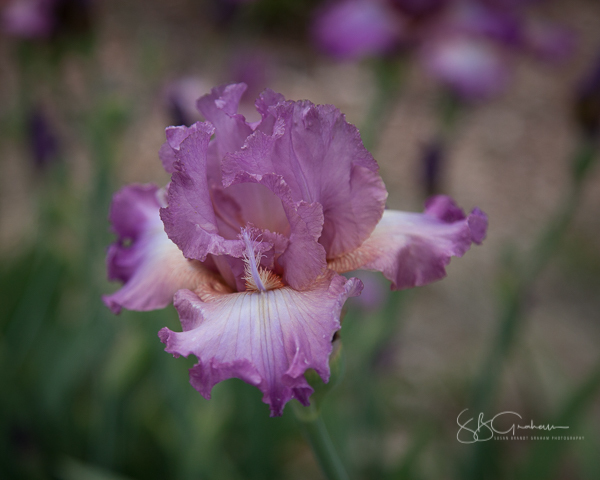 Floral photography does allow shows to thrive even with all the challenges of gardening. This year, many of my roses have bloomed earlier than usual. However, I have a couple that I have babied that will be damaged by a hard freeze now. I’m also a little worried about the developing peaches and pears in my yard. I’ll keep an eye on the forecast and see what I can do to protect some of the plants. 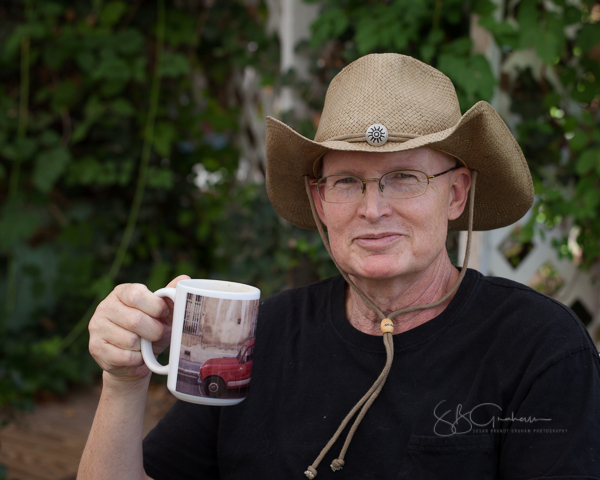 Tim and Laurie, whom many of you know, face more difficult and frequent challenges in their gardening in Corrales, along the banks of the Rio Grande. However, once the freezes end in the spring, their property is full of lush floral growth. These following images are from their yard in mid-May of 2016. For those in the Albuquerque area, watch the weather forecasts. Good luck with your tender plants if the late hard freeze really happens. 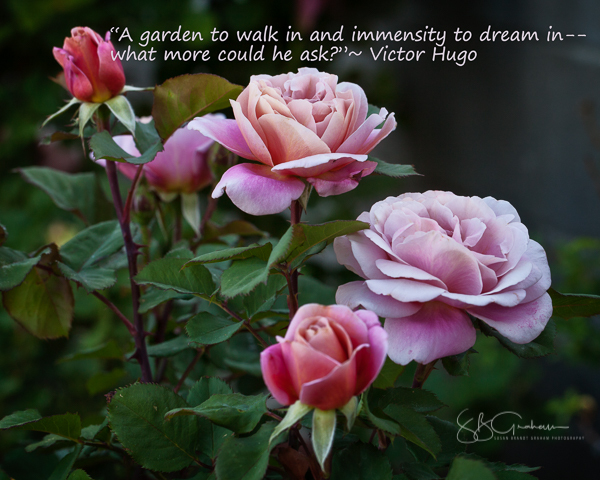 A garden to walk in…The roses in my yard are about three weeks ahead of time this year, compared to when I first came to Albuquerque. I’m definitely enjoying them now. This rose is a shrub rose, ‘Distant Drums.’ It has a wonderful fragrance, along with unique color. Late summer flowers in the Middle Rio Grande Valley of New Mexico are magnificent. Visiting with friends Tim and Laurie is always fun. Visits usually include Tim and I photographing, and Laurie sketching. This weekend was no different. Our “photographic expeditions and excursions” are on temporary hold. However, we make the most of what is locally available. Their property always has great photo ops, but their Lively Meadow is especially lively in late summer. A forest of sunflowers greets the arriving visitor. 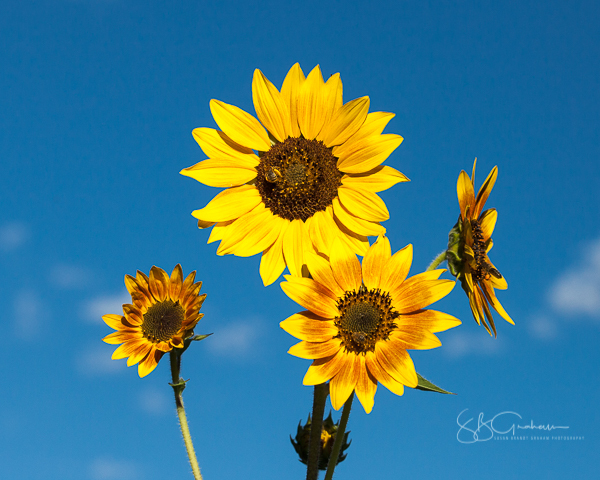 As I was driving into Corrales, I almost stopped to photograph some sunflowers growing along the highway. I laughed at myself as I drove into their property. I was also glad I did not stop along the highway! 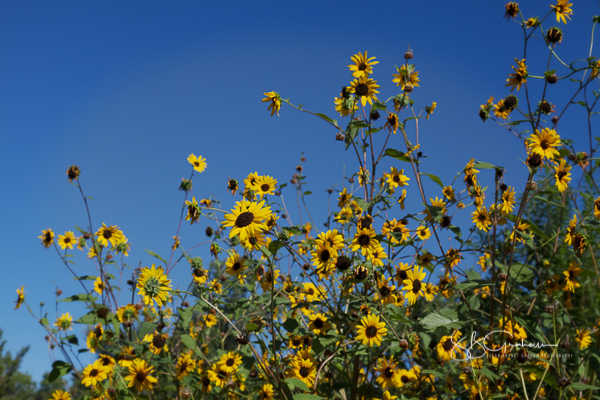 The tall sunflowers provide a natural backdrop for the cosmos. 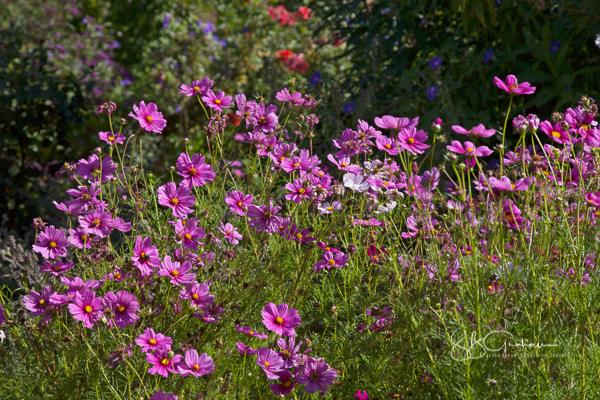 Cosmos are a riot of color. The little blue flowers are morning glories. Laurie sketched while Tim and I photographed. Later, as we always do, we went back to the house and deck. I don’t know how or why, but something a little special and always unpredictable seems to appear at just the right time. 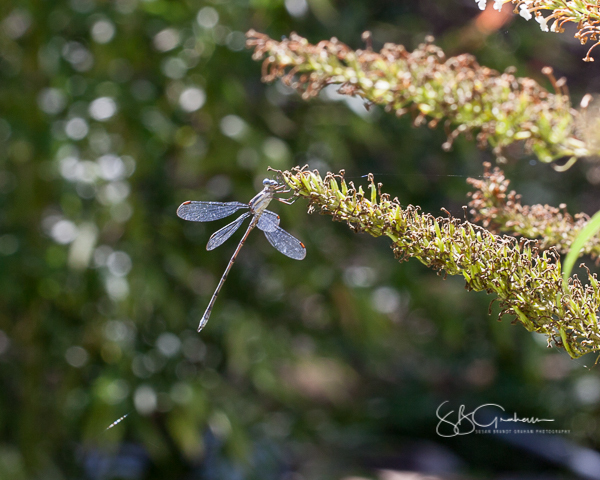 I love this beautiful, sparkly little damsel fly that visited the butterfly bush as we were enjoying conversation on the deck. 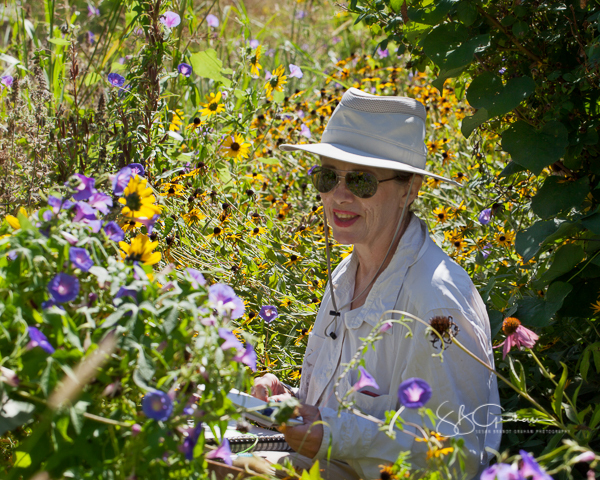 A beautiful late summer day with friends and flowers. this is not a carpenter bee. This is an anthophorid bee. 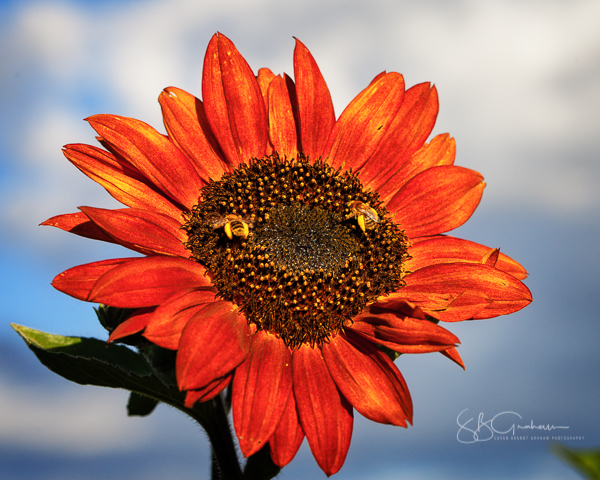 This group of bees are famous for pollinating sunflowers. The males have longer antennae than the females and this is usually how I recognize them right away. Unfortunately, I can’t see the antennae from the picture so my guess is that it is a female. I’ll be working to get a better image showing the antennae! 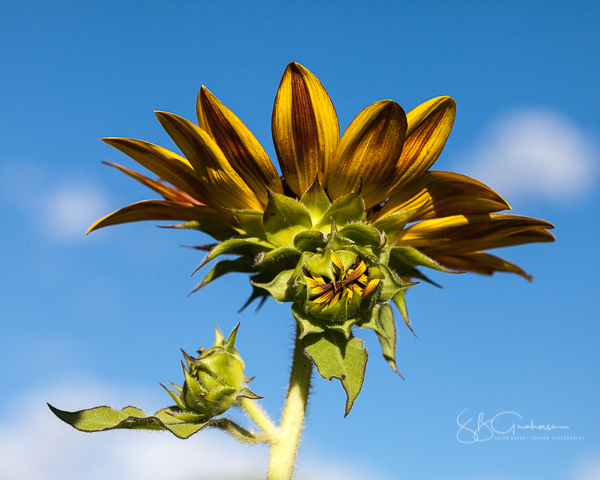 Sunflower and big bee, and a beautiful blue New Mexico sky! I was out photographing goldfinches playing on the spent sunflowers and cosmos, enjoying the seeds and showing it. This time of year I see a lot of pollinators on most of the flowers in the yards, buzzing around, very busily. Sometimes I specifically photograph them. But, this particular day I was focusing on the goldfinches. As I sat on my porch enjoying a quiet afternoon, I saw what, at least from a distance, appeared to be a HUGE bee. I’m used to the black and yellow “bumble bees,” and the smaller brown and yellow bees. But this had the appearance of a brown and yellow bee, but very large, and spending a lot of time working a sunflower. Finally, I had to investigate more closely, even though I knew the birds would fly, at least for a bit. As you can see, this was, indeed, a very large bee. And, it had been very busy! It was covered with pollen it had collected from the sunflower. I think it may be a male carpenter bee, although I need to check this identification. Under any circumstances, it was a new bee for me, and certainly caught my eye even though I thought I would focus on birds that particular day. 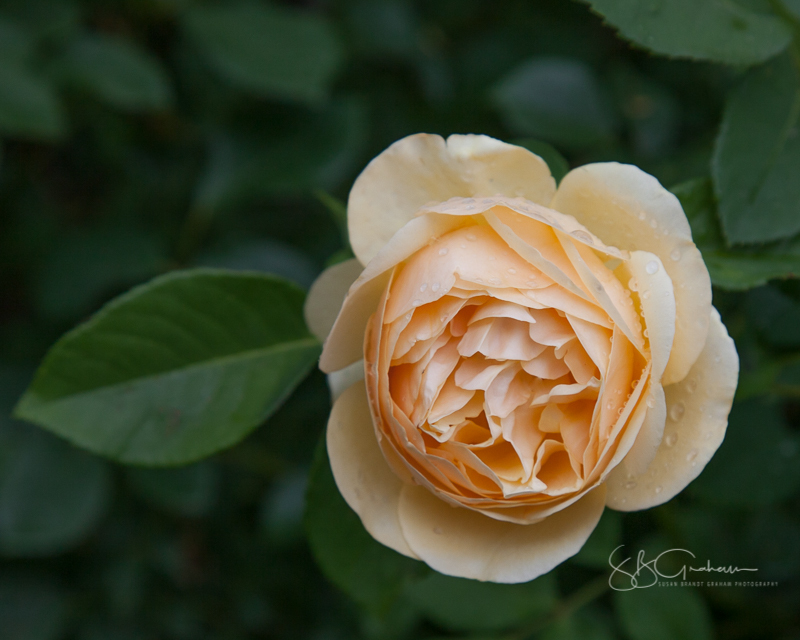 The rose ‘Gold Medal’ has long been one of my mother’s favorites. 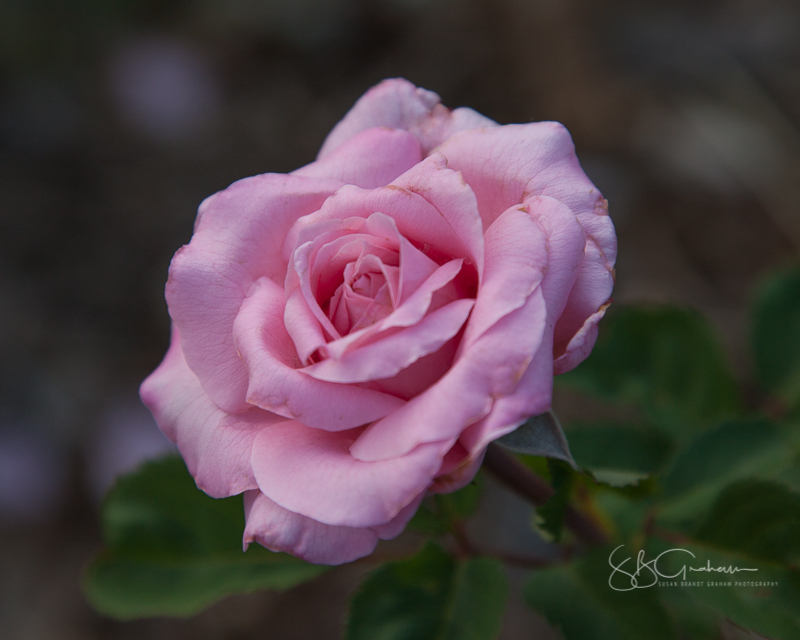 I photographed the rose in her garden near sunset. The hair streak butterfly is from a macro shot taken in friends’ garden on a wonderful day. 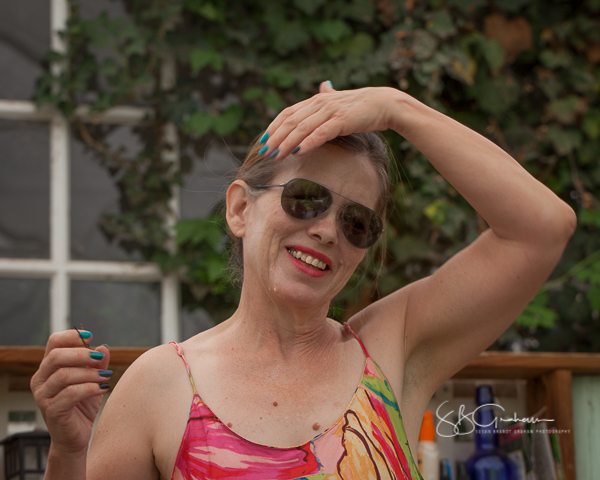 This image is a composite that brings together people important in my life and two gardens I love. 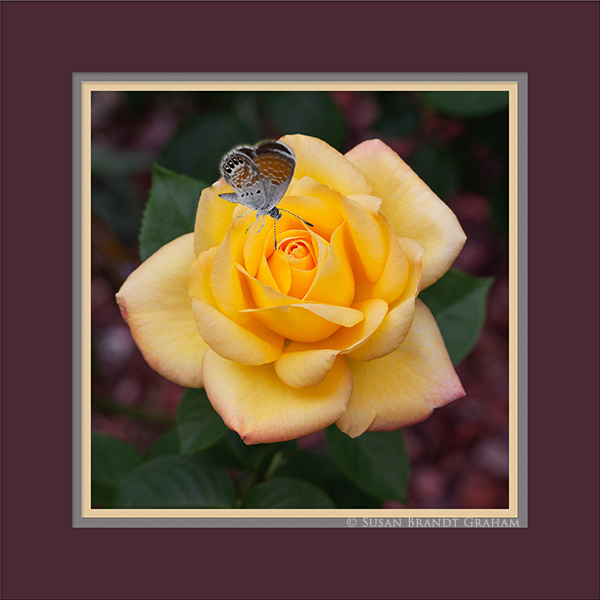 This image was chosen as the winner in the Judges Class of the 2015 American Rose Society Digital Photography Contest. I thank the special selection committee for that honor of an image that was already important to me for so many reasons. 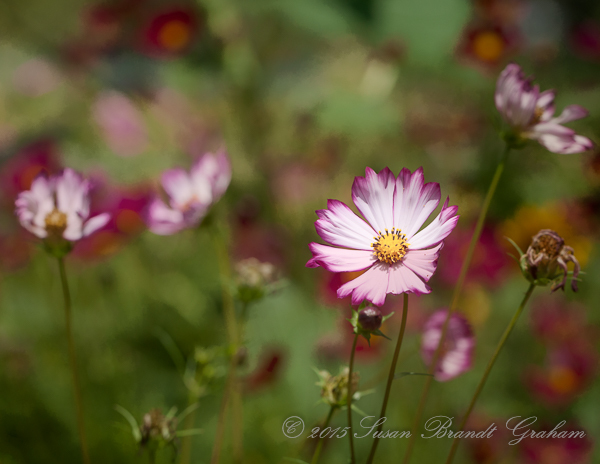 Cosmos this past Labor Day weekend were spectacular in the Corrales garden of our friends Tim and Laurie. 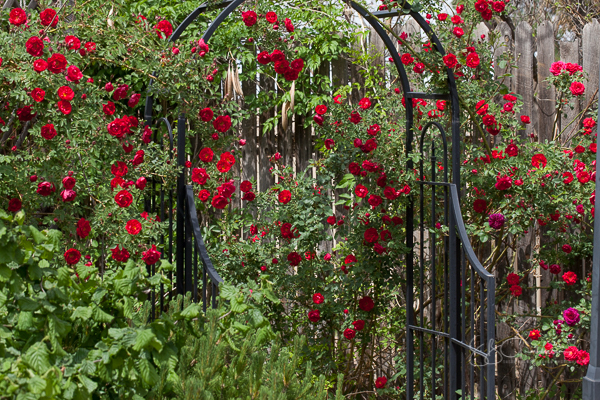 They grow many different plants, with roses being the focal point of the formal part of the garden. 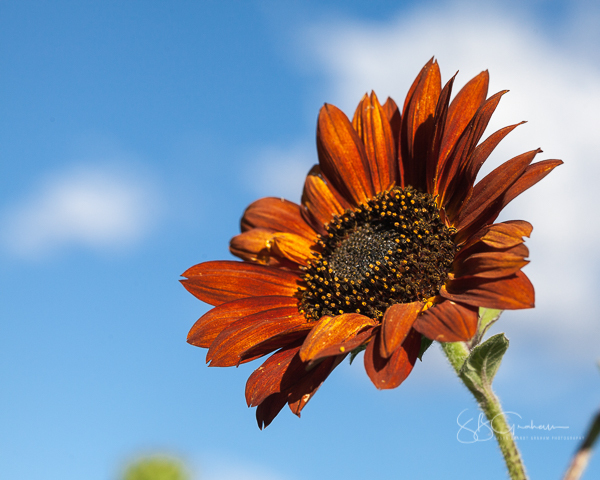 But, sunflowers, brown-eyed Susan, echinacea, morning glories, coreopsis, and others, have been allowed to naturalize portions of their land along the Rio Grande. All were spectacular this past weekend. 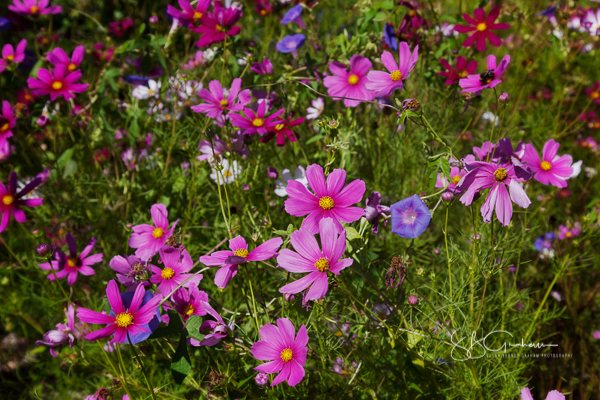 Cosmos attract many different pollinators as well as hummingbirds, goldfinches, and other birds and butterflies. The entire garden was buzzing with lively critters. 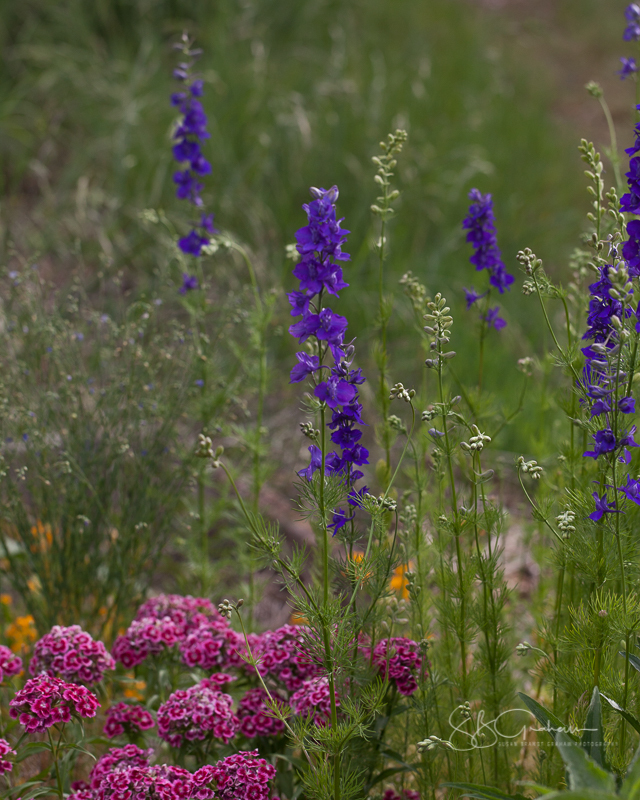 There were so many different colors and combinations in these naturalized, self reseeding annuals . 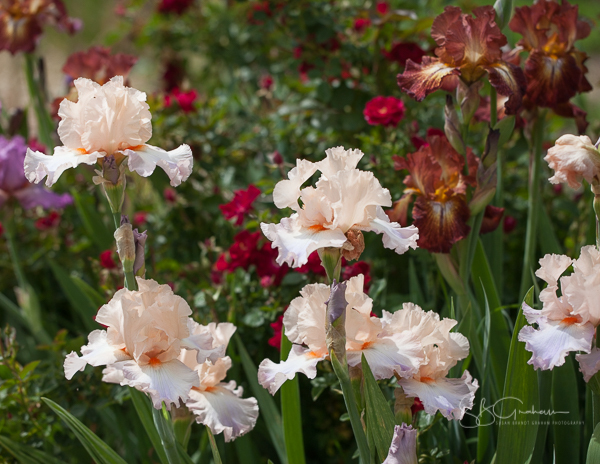 This is a small sample to give a feel for the beauty of even just one kind of flower in the garden. 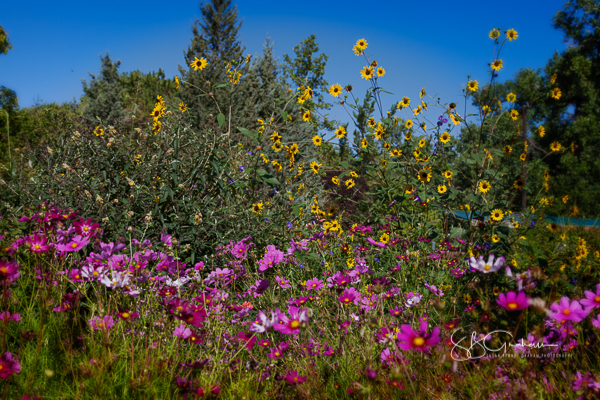 This is just a very small sample of the cosmos in the landscape. 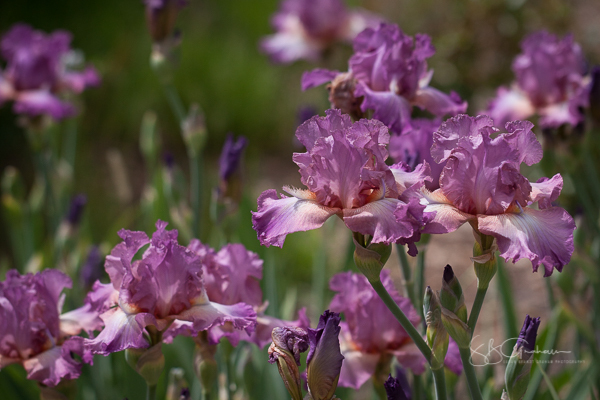 They appear among a wide variety of flowers allowed to naturalize the garden space, which was spectacular in its color and beauty this past weekend. 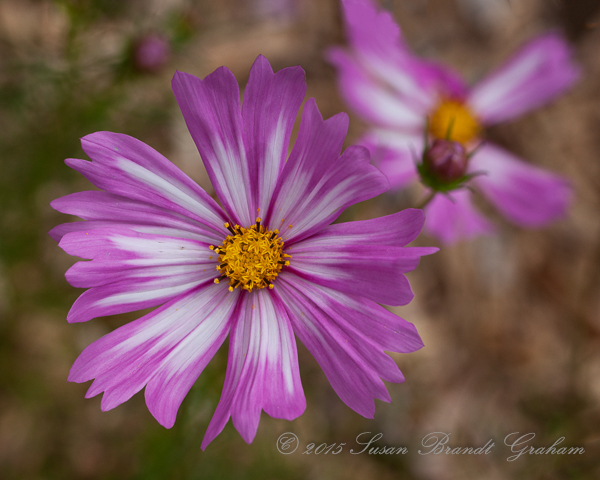 The prolonged drought has taken its toll among many flowers. One very good adaptation to that appears to be growing a wide variety of plants. 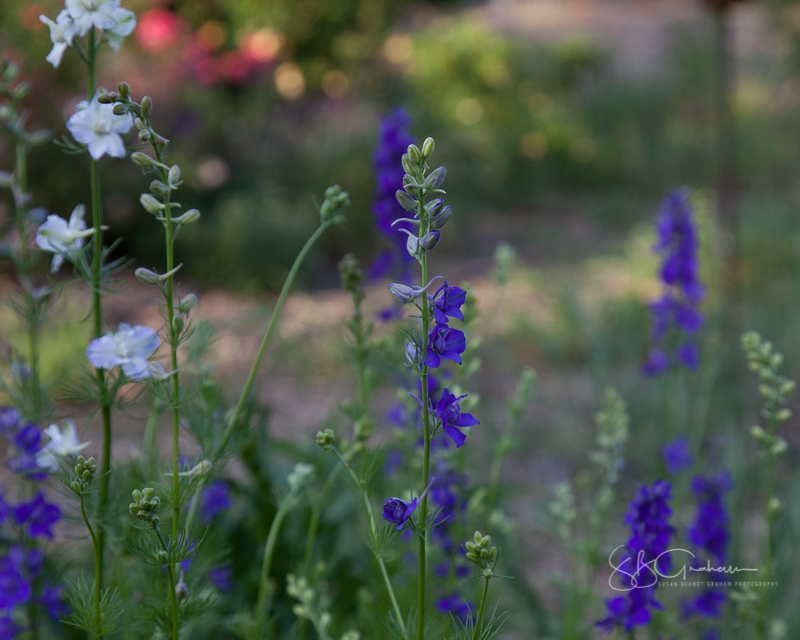 More images of different flowers growing in this beautiful space will appear later in different posts. Cosmos is an annual I grow every year, not only for the beauty of the flowers, but also because the goldfinches and hummingbirds like them. When the seeds develop, the goldfinches prefer them to the nyger seeds I usually provide. 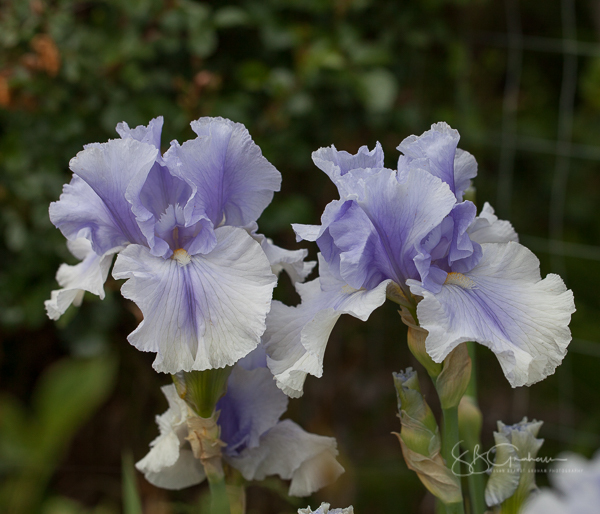 For that reason, I do not deadhead these flowers, even though I would get more blooms if I did. I grow them, enjoy them, and then enjoy watching the birds feed on them. Several days ago I posted some images from my garden, images with no editing (to say nothing of enhancements!) except for cropping and placement of a watermark. That was something of a photography exercise for me. Although I was not unhappy with the outcome, I personally found the exercise itself to lack the “fun” I find in digital photography. Last evening, for the first time in some time, I had a couple of hours to do what I enjoy – manipulate a photograph to create an image that reflected something more (to me, at least) than “a real flower captured by the camera.” What you see is the result. I firmly believe that developing a raw file is something absolutely necessary to realize the full potential of digital photography, and should always be allowed. “Enhancing” a photo through the use of many techniques, as this image has been enhanced, is very different from editing a raw file to develop it. I think any discussion of what should be allowed for any given use of an image should clearly distinguish between “editing” to develop a raw file, and “enhancing” to create an image not captured on a sensor. 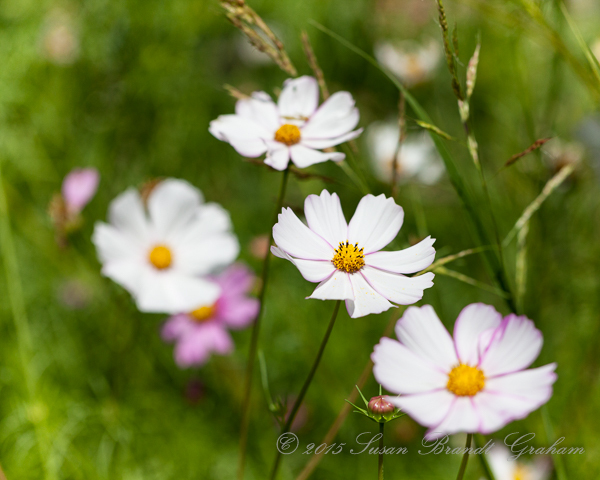 Back to cosmos – a wonderful annual for its inherent beauty, and as a natural “feeder” for birds. A good flower for the garden in the desert southwest. 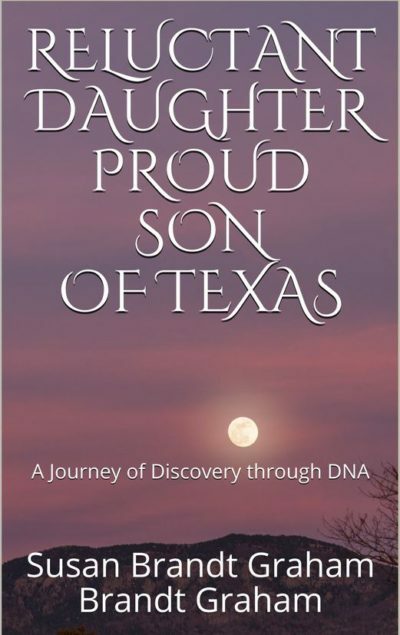 Reluctant Daughter, Proud Son of Texas: A Family's Journey of Discovery through DNA. Will be available in e-book and paperback editions. Susan B Graham is a participant in the Amazon Services LLC Associates Program, an affiliate advertising program designed to provide a means for sites to earn advertising fees by advertising and linking to amazon.com.